What if you could minimize backup windows, perform regular and efficient backups of unstructured data, and synchronize recovery between different storage media—regardless of file size? 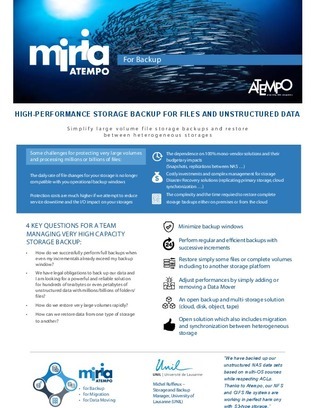 This sheet explains how the Atempo Miria Backup Tool simplifies large volume unstructured data backup and recovery between heterogeneous storage environments. To learn how your enterprise’s high-performance computing workloads can benefit, and for a comparison of this tool against traditional NAS and NDMP backups, read on.